“Intelligent fun” defines the way groups describe their experiences at Space Center Houston. A day when they’ve touched a moon rock, witnessed a shuttle launch, enjoyed a guided tour of NASA Johnson Space Center and seen real, space-flown vehicles … all this and much more, combined with a galactic group discount! At Space Center Houston, we discount the price, not the experience! 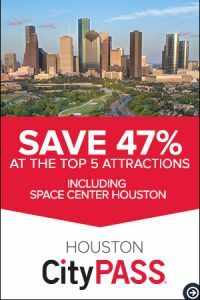 With more than 400 things to see and do, including a variety of ever changing exhibits, films and live shows, Space Center Houston is a must-do group destination. We invite you to experience space exploration through its exciting present, its dramatic history and its compelling future, all of which is included with your paid group admission ticket. Space Center Houston is a nonprofit science and space learning center, the first Smithsonian Affiliate in the greater Houston area and the Official Visitor Center for NASA Johnson Space Center. We offer a full day of interactive group fun for all ages. 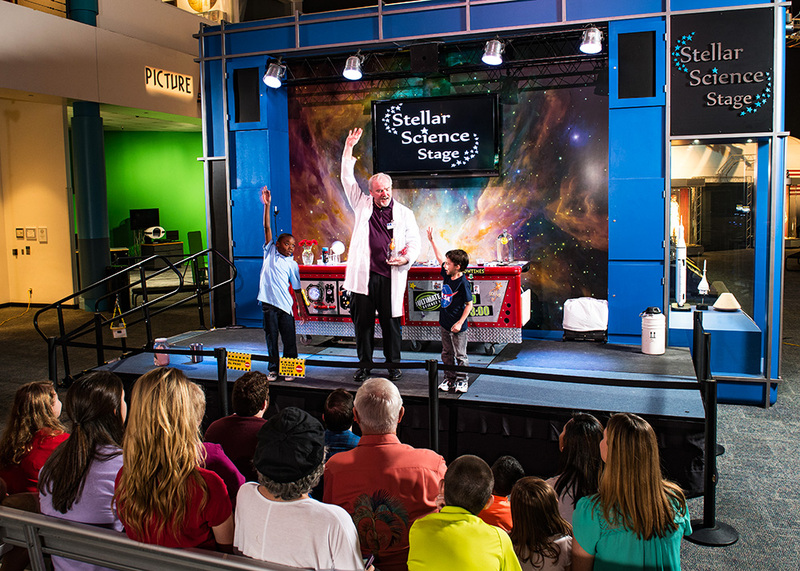 With more than 400 things to see and do, including a variety of ever changing exhibits, films and four live shows, Space Center Houston is a must do group destination. We invite you to experience space exploration through its exciting present, its dramatic history and its compelling future. A must see is the international landmark Independence Plaza, presented by Boeing. Touch interactive displays, see NASA artifacts and learn about the legacy of the space shuttle program. Meet an Astronaut every Friday and Saturday and hear fascinating stories about their space adventures. Learn how astronauts live and work aboard the International Space Station in the Living in Space presentation. Explore the technology developed by NASA and other in the International Space Station Gallery. Watch a film in Space Center Theater with stunning 4K ultra-high definition, new audio and an all-new-giant screen. Get NASA updates and learn about future NASA programs and missions in the Mission Briefing Center. See flown spacecraft such as Apollo 17, walk through Skylab Trainer and touch an actual moon rock in the Starship Gallery. Board the NASA Tram Tour and see history in the making. Stops include Mission Control, astronaut training facilities and Rocket Park, where you will see the enormous Saturn V rocket. This and much more, combined with a galactic group discount! To be eligible for the best discount ($15.95 per ticket), the group must purchase a minimum of twenty (20) tickets and prepay 7 days in advance of the visit date. Register online OR call +1 281-283-4755 to pay with a credit card OR submit the order form via email to reservations@spacecenter.org, fax to +1 281-283-4766 or mail to Space Center Houston Reservations, 1601 NASA Parkway, Houston, TX 77058. Be ready to enjoy a day of exploration, discovery, excitement, education and fun all rolled into one. With our special group discount, you can save up to 46 percent off admission and as a bonus groups will receive one (1) free ticket for every twenty (20) tickets purchased. Group discounts are not available for same-day visits. See the prepaid group rate or pay–on-arrival information to make your selection. Pay your group order at least 7 days in advance to receive the prepaid group rate of $15.95 per person. Additional tickets on your date of visit or under 7 days, may be purchased at the discounted rate of $17.95 per person, additional complimentary tickets will not apply. Prepay via credit card online or by calling our Reservations department at +1 281-283-4755 or submit the group order form via email, fax or mail. Not able to prepay for your visit? 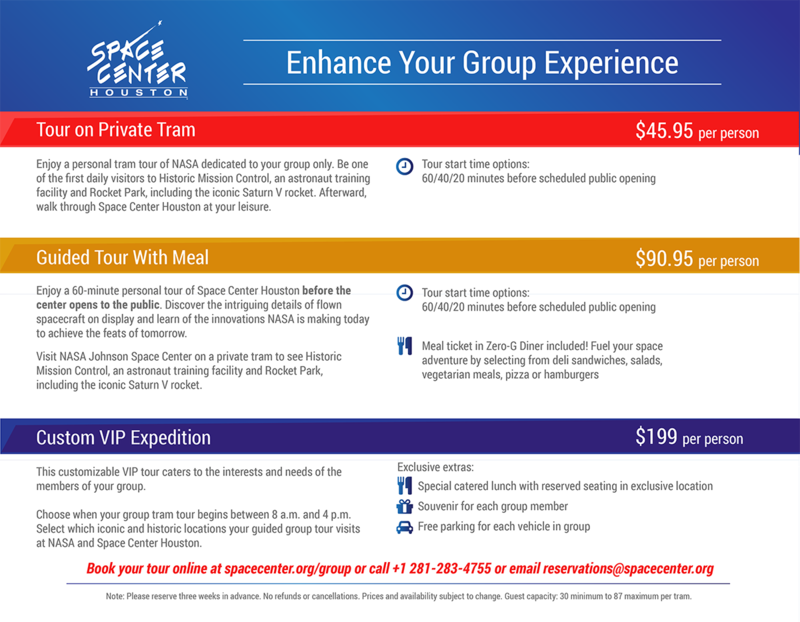 No worries, call Space Center Houston group reservations at +1 281-283-4755 at least 24 hours in advance of your group’s visit to reserve your group tickets. The pay-on-arrival rate of $17.95 per person which is a group savings of over 40 percent. Our staff will answer all your questions and assure your entrance into Space Center Houston is without delay. Be sure to check out the group lunch options. A group lunch is a great way to get everyone together for a delicious, nutritious event where they can exchange stories and make memories that will last a lifetime. The group ticket includes more than 400 things to see and do at Space Center Houston, including many exhibits, two films, four live shows, several artifact galleries, Independence Plaza, the NASA Tram Tour, three VR experiences, three films and more. There are three virtual-reality rides that are not included (additional $6, $8, and $10 per ride per person). There is a $5 parking fee per vehicle, which is waived for buses. Do bus drivers need a ticket? Bus drivers do not need a ticket, but they must present their ID at the Guest Services Desk upon arrival to receive admission into the center. Can my tickets be sent to me before the trip? Yes, groups with less than 75 tickets can receive tickets via email. Groups with 75 or more tickets can receive tickets by mail. A $20 shipping fee will apply. Contact reservations for more information. May I get scheduled into a film time? No – seating for all films and shows is available on a first-come, first-served basis. Can we bring our own lunches to eat inside Space Center Houston? Outside food is not allowed inside the center. We do have a covered picnic park area adjacent to the guest parking lot which is available on a first-come, first-served basis. The covered portion seats approximately 75 and the perimeter seats an additional 50. Coolers must remain on buses. How long does the NASA tour take? The NASA Tram Tour takes approximately 90 minutes to complete. May I reserve a specific tram time? No tram experiences cannot be booked online. Public tram experiences are on a first-come, first-served basis. Private tram experiences may be booked through our Reservations Department. Trams usually depart every 20 to 40 minutes and last 90 minutes. Please check the show schedule on the day of your visit. How long should we plan for our visit to Space Center Houston? The time spent inside Space Center Houston depends on how much your group wants to do. There are two films, four live shows, several artifact galleries, many exhibits and the NASA Tram Tour. Planning three to five hours will allow your group to see many things. 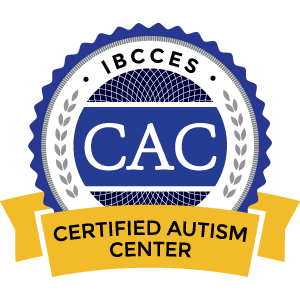 Come as soon as the center opens to have the best experience. The NASA Tram Tour is the only part of your day that will be guided as part of your admission ticket. Touring the inside of the center is self-guided. Please use our free app or the Map and Guide to plan your day. Are maps of Space Center Houston available? A complimentary map of Space Center Houston to plan your day may be found inside the Map and Guide, available at the Guest Services Desk. What if I paid for tickets but need to cancel my visit? Cancellation and Reschedule Policy: All tickets are non-refundable. In case of a group cancellation, tickets are valid for 1 year from the date of purchase. Group meal tickets are valid for one year from the date of purchase.